Absolutely the best kept secret on Oahu, the Hawaiian Princess Resort is only 45 minutes away from the airport, less than an hour from Waikiki, and a world away from the crowds. Located on the sunny leeward coast of the island, this condo is situated on a long white sand beach. Enjoy a quiet, peaceful morning walk along the shore where you may be the only one on the beach. Watch spectacular sunsets over the ocean as you dine on your private lanai. Fall to sleep each night listening to the rhythm of the waves right outside your door. The ocean in front of the condo has abundant aquatic life. You can swim with the many sea turtles that frequent the area, or spot tropical reef fish and an occasional eel while snorkeling. Watch the dolphins play in the cove. In the winter, observe the whales from your private lanai. Even the endangered Monk seal occasionally pays a visit to the beach. When the surfs up, you can boogie board or even try surfing. All of these activities can be experienced right outside your front door. Resort amenities also include a pool, jacuzzi, picnic area, tennis court and a game room. Also, within a very short distance you will find two outstanding golf courses, deep sea fishing, and fine dining. Our upscale condo has been recently remodeled. with the best of everything. Amenities include a fantastic bedroom with a wall-mounted flat screen TV, engraved banana leaf furniture and a king-size bed with a luxurious memory foam mattress topped with Hawaiian quilt and shams. It also has a spectacular, fully furnished kitchen with cherry wood cabinets including a built-in hutch, an engraved and hammered copper sink, GE Profile appliances, Silestone countertops and a tropical bamboo ceiling. The bathroom has a beautifully tiled, large walk-in shower with the ever popular, rain style showerhead and horizontal body jets. There is also an engraved copper sink and Danze bamboo faucets complimenting the cherry vanity. The condo has and HE5 large capacity washer and dryer and bamboo flooring throughout. The living room has a queen-size sofa sleeper, large flat panel TV. The sunset-ocean view from the lanai (and living room and kitchen) is nothing short of breathtaking. The condo has been decorated in tropical colors and accented with bamboo wall coverings. The condo comes equipped with all linens, kitchenware and beach equipment that you will need for your stay in paradise. No expense has been spared to make this condo one-of-a-kind. It is perfect for honeymoons, anniversaries or anyone else who deserves the very best. If you want to pamper yourself and spend some time on the island living as Ali’Ii (Hawaiian for Royalty) this is it. All sheets, pillows, beach towels, towels, etc. Condo was as advertised. Condo had newer appliances and clean. Beach chairs, umbrella, cooler to use. I gave it four stars because the pool water was cold. We had whales come by every evening with gorgeous sunsets. Highly recommend it. Aloha and thanks for staying in our condo. In Hawaii, most pools are not heated, even a some of the larger resorts. Unfortunately you came during a cooler time period. Hopefully everything else was to your satisfaction and the incredible sunsets over the ocean made up for a cool pool. Mahalo nui loa for staying in our condo. Great access to a nice. uncrowded beach. We saw whales out at sea regularly and saw a sea turtle while snorkeling in the bay. This building seems mainly inhabited by owners and long-term renters so you can take advantage of getting to know your neighbors if you plan to stay for a while. Plan to stock up on food and be your own bartender - there are no restaurants on the property. The Tamura Super Market a few miles south on the highway had most of what we needed. I am happy that you enjoyed your stay in our condo. It really is a nice spot to see turtles. Should you decide to return, we would love to have you as guests in the future. Your own piece of paradise away from the crowds. We had an amazing time here with my family of four with two children - 6 and 3. The condo was well equipped and stylishly decorated. A couple minor issues with the dishwasher and dryer which were handled immediately (same day). The beach is gorgeous, but the surf was too high for my children to play in the water there (typical for the winter months I’m told), but there was a another beach just minutes down the road (Pokai Bay) that was calm and perfect for the children to swim. We still played on the beach at Hawaiian Princess most days. Everyone at the condo complex was friendly and accommodating, Kathy and her husband Mike were great to deal with. This was one of the most beautiful and relaxing vacations ever. We look forward to planning our return trip! Facility is getting long in the tooth !! Great ocean views, nice sand but surf can get rough, neighbourhood is seedy leaving much to be desired, units are old and dated and in need of a major overhaul, not a great value for your dollar !! Mahalo for your review, but I am a bit confused. You mention that the "units" are old and dated. Perhaps you are talking about friends that rented other units. This condo has been totally gutted and remodeled. The kitchen has a copper sink, quartz countertops, stainless steel appliances. The sofa is brand new and the bedroom furniture is imported, carved Mahogany. There have been 36 reviews on this condo, 33 of them are 5 star, two of them 4 star. We are very happy to do our best to make sure our guests are comfortable and if you found that things were not to your liking, you only needed to give us a call. We are only 5 minutes away and very willing to do what we can to make our guests happy. Fabulous unit right on a great beach. This area is secluded and away from hustle and bustle of the city. Walk right down to your own beach for snorkeling, boogie boarding or just sunbathing. Even on weekends this beach does not get overcrowded. This is a great unit for a couple. 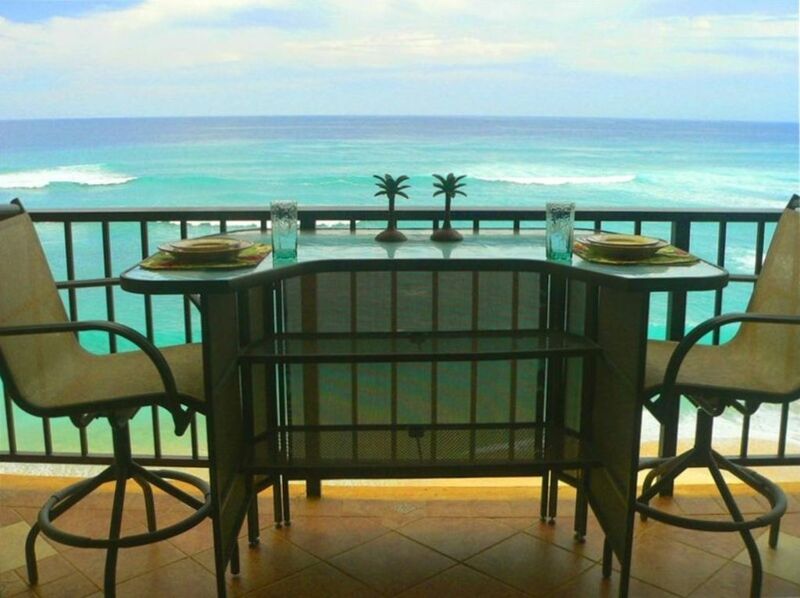 Enjoy sunset dinners on the lanai overlooking the beach. We look forward to our next visit and stay in paradise. Mahalo for your kind words and also for staying in our condo. We very much enjoyed hosting you. We would love to have you return in the future. We had a great stay here. The view from the lanai is amazing. The beach is beautiful and not very many people. The condo was great. It was comfortable and had everything we needed. We would stay here again without hesitation. Mahalo for the kind words . We are happy that you enjoyed your time in our condo and would love to have you return in the future.